Peter Rosei was born on June 17, 1946 in Vienna. His father was a railway employee and his mother was a shopkeeper. He attended a Gymnasium (university-preparatory school) and then studied law at the University of Vienna, where he earned the Doctor of Laws degree in 1968. He worked for a time as the secretary and manager of the Viennese painter Ernst Fuchs and then ran a textbook-publishing house. 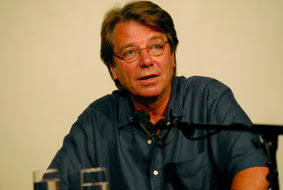 Since 1972 he has been a freelance writer, mainly in Vienna, but from 1976 to 1981 he lived near Salzburg. Rosei is best known as a novelist, but he has also written essays, travel essays, published journals, plays for the stage and radio, childrens’ books, translations from the Italian (with Christa Pock), and poetry. The author’s early fiction emphasized landscape description and the precarious relationship between humans and nature. Later his panoramic novels dealt with dynamic but ruthless social systems and the loss of identity within them. His breakthrough novel, Wer war Edgar Allan (Who was Edgar Allan, 1977) depicted the aimless life of an expatriate German student in Venice. It was filmed by the noted Austrian filmmaker Michael Haneke in 1984. His fifteenth work of fiction, Madame Stern, was published in 2013. Rosei has traveled throughout the world and has lived in the USA in Oberlin and Bowling Green, Ohio, and in Nagoya, Japan, as a writer in residence. Several volumes of his prose reflect on travel as an epistemological and existential challenge. In recent years he has regularly published newspaper essays on economic, social, and cultural issues, and a series of four novels starting in 2005 with Wien Metropolis (Metropolis Vienna, Green Integer 2009) have critically represent Viennese and Austrian society since World War II. His Try Your Luck was translated by Kathleen Thorpe in 1994 and From Here to There, was also translated by Thorpe in 1991. Das Lächeln des Jungen. 59 Gedichte (Salzburg: Residenz, 1979; Regentagstheorie. 59 Gedichte (Salzburg: Residenz, 1979); Viel früher. Gedichte (Graz: Droschl, 1998). are fighting in the pit: what pit? once they loved me too. English language copyright ©2003 by Geoffrey Howes in Ruthless and Other Writings (Riverside, California: Ariadne Press, 2003).